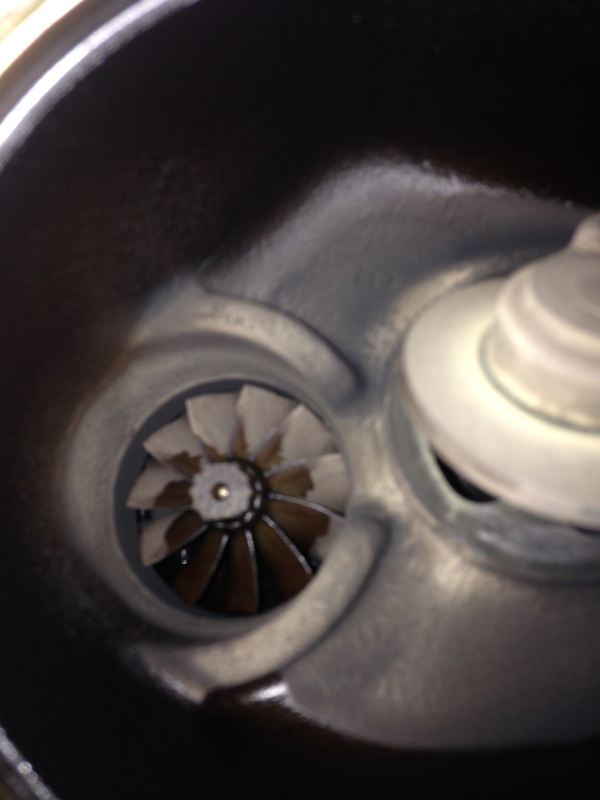 Ok I know I have posted these type of pictures before,,,,but you guys keep asking for more of them,,,,this is the exhaust side of a N20 turbo,,,,you can see on the exhaust turbo blades oil on the blades,,,this is the sign of a bad turbo,,,,the seal inside the turbo is letting oil past the exhaust turbo blades. Here you can see the oil spraying off the exhaust turbo blade and onto the exhaust housing,,,,and from there it goes to the catalytic converter,,,,,,then you get the smoke coming out the exhaust during cold start,,,,if it gets real bad you might see smoke during acceleration,,,,,this car I replaced both the turbo and updated with the new oil feed line. 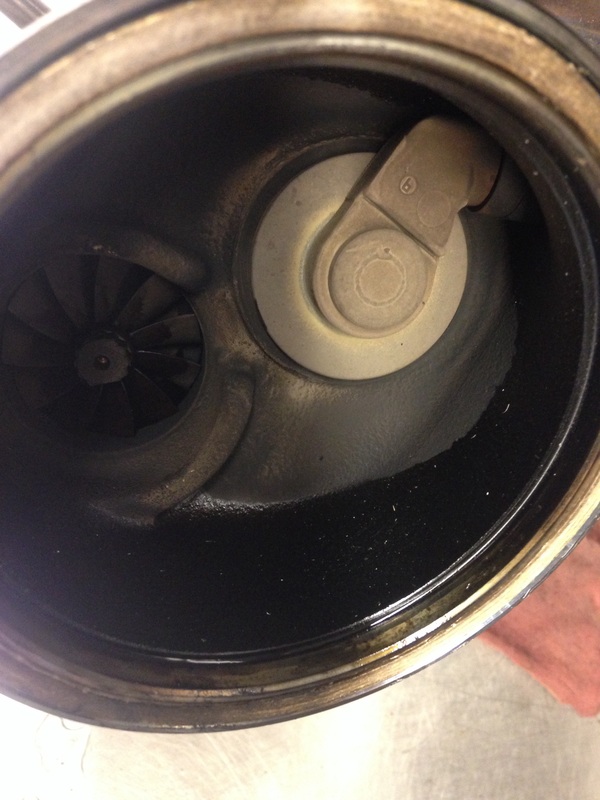 This entry was posted in Uncategorized and tagged N20, oil leak, turbo. Bookmark the permalink. I would expect the catalytic converter to fail at some point as well? Which can be as expensive as the turbo? I thought the catalytic converter didn’t like oil. It doesn’t ,,,,,but it’s not a large amount of oil that is being dumped into the cat. Thanks for your willingness to help…. MUCH appreciated, one last question, if they replace the turbo do they have to take out the engine? I think i have some simmular problem, on the motor mount under the turbo there is a spot of an oil leak. On cold start after more than 24h there is a puff of white/bleu smoke and my 320i n20 engine is from late 2012( i think first building series of the f30) but my dealer gues that its a broken valve cover… dusnt make any sence… atleast thats my oppinion. So what do you think of the diagnostic vision of the valve cover? Is there any way to maybe test it or what to check for? I now have a case running whit bmw benelux to figure out who and what whent wrong at the dealership where a buyed the car, why my dealership think its the valvecover and why the european warantybureau dont want to pay even if i have a full package for a year. It could be the valve cover,,,the dealer can check the engine vacuum from the oil cap,,,,and if there is to much vacuum inside the engine it could be the valve cover,,,,,but I have only seen 1 valve cover cause smoke in the morning during start up,,,,the valve cover usually causes a lean mixture fault not a smoking issue. Thats my gues to, just becuase there is no check engine light and no faults on the onboard computer. Maybe i can make my own vacuumgauge and test it myselve. Also i think there should be a milky oil color under the oul cap with a broken valve cover. If this al turns out that i have to pay it myselve than i go and fit a upgraded turbo frm a 42 mm to a 47 mm inlet and spice up the hp + order the upgraded oil feed line and place it all, just like i fixed my e46 if there was someting wrong with it. For this moment BMW has failed bigtime for making this engine and this turbo, the internet is loaded of this problem and for my opinion they do nothong about it. Same for the timing chain, that was a problem from about 2002/2003??? And still now they make this plastic chainguides that needs to be changed after 60k miles? Its just sick. Yes it is very sad,,,,you won’t find a white milky under the oil cap,,,,that only happens when a headgasket or head fails,,,,you can check the engine vacuum by loosening the oil cap while the engine is idling,,,,there should some vacuum on the oil cap while removing it,,,,if it is very hard to remove the oil cap while the engine is running then you have a bad valve cover gasket. Got a update for the vacuum check… and no big vacuum under the oil filler cap. Warm or cold engine, there is ni difference in the vacuum pull of the cap. It is very easy to remove and there is indeed no milky substance on the cap, great news because its not a blown head gasket. Again on the underside of the turbo pleanty of wet oil marks so lets go to the dealership and get the car fixed. Is there anyway to demand that i can get a new/rebuild turbo an upgraded oil line? Or do they always do a diagnose everytime you enter the shop? I think these engines run hot. Its a reliable Mitsubishi turbo that only fails in the bmw. Same with the chain likley the guides get brittle from heat. Is there anyway to get the fan to switch on before its temperature and drop the running temperatures 5degrees or so? Yes these engine do run hot for the emission. You help me, i changed that turbo oil feed line with a new one with check valve, and everything is ok now. How did you replace the turbo line? Did you bring to the dealership? I think I have the same issue, the car is slightly smoking from the exhaust after sitting for at least one day. It get worse and highly noticeable after sitting for 3 days. Do you know in which year the turbos quit smoking in N20 E84 X1s? I’ve seen plenty of 2011 to 2013 models with the problem. Are the 2014-15s OK without the new oil line? How about the 2016 & up F48s? Hi, i have another problem, when the engine is cold, i start de car, and with de foot on break, i put the car in drive mode or rear mode, in that moment i feel and i hear a vibration until 2 or 3 seconds. It is normal? I’m sorry this is very difficult to say without seeing and checking the car in person,,,,what you can do is check out the motor mounts and make sure they are not collapsed,,,,I have post about collapsed motor mounts on my blog. I bought my 2013 X3 into dealer for timing chain. Have had repeated and lengthy issues with car including hesitation on acceleration/deceleration and blowing smoke from tailpipe and (since about 20,000 miles). Turbo Oil feed line was replaced in 2016 (at 49,000 miles and after being brought in a half dozen times over a long period for same issue which they always stated that they could find nothing wrong) as it was deemed defective by dealer and they stated that it was responsible for issue with smoke. One tailpipe was noticeably blackened with residual oil in tailpipe which they stated is normal. Car is still blowing smoke today and I am concerned that damage was done from longstanding issue with oil line/turbo charger. When timing chain was replaced, dealer informed me that there is an issue with the Waste Gate Pin which is attached to Turbo unit. He stated that it is a one piece (turbo charger and waste gate pin) unit that needs to be replaced and is not covered by warrantee. It seems that this is longstanding issue that was not addressed and now that car is out of warranty they have finally identified issue that has been there all along. Have you encountered this and does it appear that this was the cause of issues all along? Thank you for your assistance and sharing your expertise!